A bout of last-minute shopping resulted in another trip to Marylebone High Street, and for lunch we decided to duck over to Baker Street and have a Jewish lunch from Reubens. 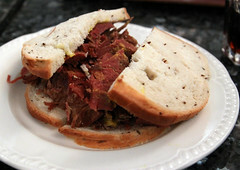 Reubens is your basic Jewish Deli, not really all that different from it’s counterpart in, say, New York. The biggest difference is in the terminology: in Britain, what we would call “Corned Beef” in the US is called “Salt Beef” over there (the term “Corned Beef” in England implies the pre-cooked nasty stuff in the tins). But back to the meat itself. Regardless of the name, the resulting sandwich was quite good. The meat tender and plentiful, the rye flavorful and substantial enough to hold up to the juices of the beef, and the mustard being good tangy Colman’s. This pretty much just worked. Less spiced than a New York pastrami, and less smokey that a viande fumee, this was basically what I’d call a really top notch corned beef sandwich. 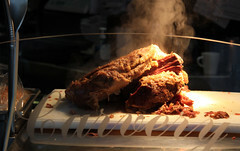 Or salt beef. It’s all good. As far as non-sandwich accompaniments? Reubens is hitting on all cylinders here as well. We ordered up a whole mess of sides, including some latkes, some salads, some pickles, and some chips. 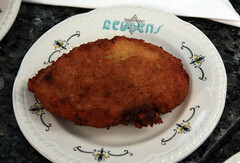 The latkes we had were quite nicely fried up, and not overly greasy, with just a hint of herbs rounding out the potato. The chips where nicely done as well, with the sort of texture I always like: fluffy in the middle, barely crisp on the outside. Overall, a very pleasant dining trip that was a nice respite from the fairly dreary weather and last-minute shopping headaches. Drooool. My dad used to love reubens.. Your new blog looks awesome btw Kaszeta!! Thanks. It has been a pretty major retooling of the blog, but I think it’s both better looking and more informative than it was before (still have about 25% of the entries that I need to geocode, thumbail, etc). I’m hoping my readers like the new site as much as I do.